Today we are interviewing young adult author Shea Norwood. 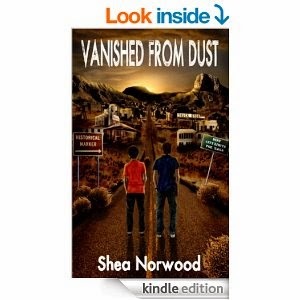 Vanished from Dust is a page-turning adventure about a small town boy, Eric Stark, struggling to find his place in a world that doesn’t understand him. He enlists a new friend to find the truth behind the nightmare that has haunted him since a young age. But, they soon discover the truth isn’t what they expected and they find themselves lost in a world that is very different than their own. Who (age, gender, etc.) do you think would most appreciate this book? This book is appropriate for those of all ages. The concept for the book began nearly 15 years ago when I wondered – what would it be like to look into a mirror and see someone else staring back at you? This singular story point went through several evolutions before becoming the published version you’ll see today. The inspiration for the setting came from my own childhood, growing up in the small rural community of McCamey, Texas. Eric Stark was my favorite character to write. I liked the evolution of his character throughout the book as he struggles with his identity and finally uncovers his true potential near the end. Writing has been a passion of mine for a little over 20 years. I love to get lost in the limitless potential of a story and to share it with my readers. There are too many to count! There are a lot of great writers out there, but my all time favorite is Stephen King. His books sparked a fire in me that first fueled my desire to write. I started writing short stories many years ago, several of which had excellent story lines but lacked any formal structure. In those days I wrote only to get the stories out of my head! Today, my writing has grown into more complex storylines and organized plots. My goals for the next ten years would be to continue to improve my craft and hopefully produce a product that my readers enjoy. My first readers are often my family and friends. I count on my wife to provide the initial critique of my characters and main story points. She often provides valuable insight. I have a few other projects in the works. However, my next completed project will be the sequel to Vanished from Dust.